I just received a comprehensive message from the White family, looking for boat names that fit their profile. Please read on and post comments below mine. message: Well, we just got a larger boat to fit our family of 7. 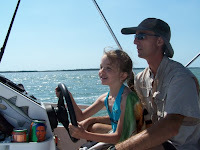 It's a hurricane (pontoon) boat for our family to enjoy fishing and island exploring on the beautiful West coast of Florida. We need to name our new boat something original and family friendly. A few details about us to help with a name: 5 kids 7 total family members. White is our last name. My husband is a cop. We are Christians and were thinking of a Bible verse or some other reference to fishing and the disciples. We'd love some suggestions. Thank you so much. Oh, and we do have a list that the kids came up with. It's down to 4, but we are most definitely open to more suggestions. Well, of the suggestions their family already came up with, I like "The Great Whites" the best. However, I would go with different variations on the theme - since they've got such a great name - and maybe consider White Caps or White Nights. Easy! Call your boat: "Peace Be Still"
White Fang(s) would be great name for your boat too I believe. As you may know Jack London's Dog hero in one of his books in Alaska. Actualy its also my boat's name too. Mine is a Bavaria Cruiser sail yacht. Its both my dog's name and also my boat's name.